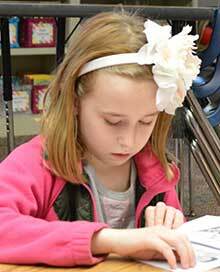 After the school day ends, second-graders at Beach Elementary are still at work to become masters of the alphabet. In “super switch” groups based on reading level, they travel to other classrooms to receive extra help with reading. Most join larger groups, while some form small groups to receive more individualized attention. 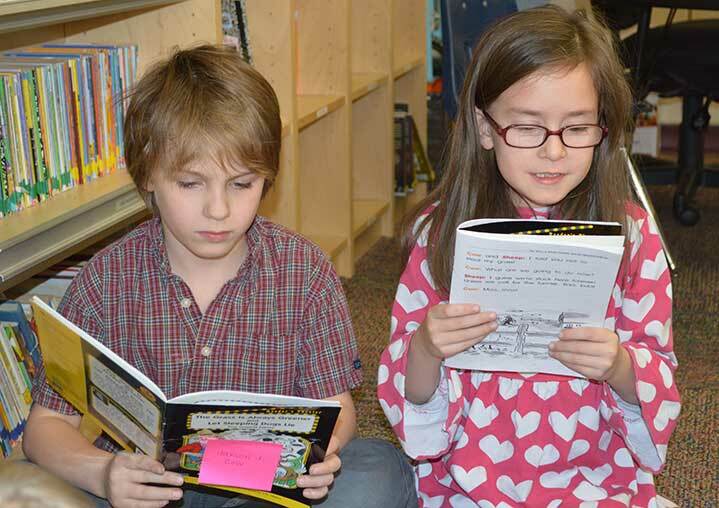 In a large, at-and-above reading level group, Jaxton Judis and Makenna Mason took turns reading to a breakout group of their peers, laughing along with the characters’ adventures. A room over, Tucker Dines, a second-grader, began the year at Level D. By sounding out words as he goes, he has already moved up to Level I, as he approaches his goal of K. To get there, he is reading books at Level J, between his current and goal levels. Super switch began this school year with guidance from Reading Now Network, an effort involving 13 counties and 100 school districts in West Michigan, who are learning from and sharing practices to improve reading. Principal Miranda Latimer said the goal is to help students to be reading at their grade level by third grade. Test scores are already showing improvement, she said, but another tangible sign of progress is the students’ enthusiasm for reading. “They are so excited,” Latimer said. “The reason is because they all know what their levels are, and they also know what their own goal is. I think when you look at it as their own growth, they’re more intrinsically motivated. They want to grow for themselves. The real measuring stick will be the M-STEP, a standardized test implemented in Michigan in the 2014-15 school year. The data will bear out the scope of the school’s overall improvement, but progress can be seen in individual students who reach their goals. “When I do the lower groups, the smaller groups, I’m able to see their growth a lot more,” said Beach teacher Amy Dood, adding that students who previously shied away from activities are more encouraged in a setting with their peers at a similar level. “Some who might not volunteer as much are getting into the action and having fun, and getting to enjoy it,” Dood said. 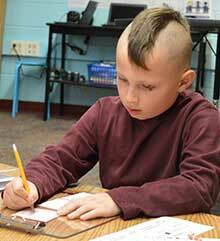 Barb Johnson, director of academic programs at Byron Center Public Schools, is helping Latimer continue the practices as the district looks to prepare students for third grade. As a principal at Byron Center, Johnson said she saw the group reading make an impact on her third-graders. She thinks Latimer, in her first year as Beach Elementary principal, is a good steward of the practices.